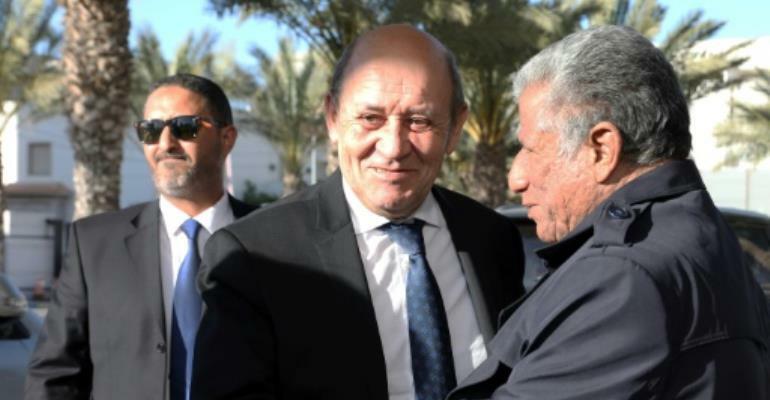 France's Foreign Minister Jean-Yves Le Drian on Monday praised "significant progress" made in southern Libya by strongman Khalifa Haftar, a rival to the UN-backed government. Haftar's self-styled Libyan National Army launched an offensive in January to take over the vast southern desert region, which had become a holdout for jihadists and traffickers. "Significant progress has been achieved in the south of the country in the face of terrorist groups, organised criminals and armed foreign groups who, for a long time, have fuelled instability in the region," Le Drain said during a visit to Tripoli. France hosted a landmark meeting between Libyan rivals in May 2018, during which they agreed to hold elections, although violence and political divisions have meant no vote has been scheduled. Haftar met in Abu Dhabi last month with Fayez al-Sarraj, head of the administration supported by the United Nations, where they reasserted the need to hold elections. "France hopes that this agreement will be executed quickly, in a spirit of national harmony and cooperation," Le Drain said after meeting Sarraj. France's top diplomat is also due to meet Haftar and UN envoy Ghassan Salame during his Libya visit. Haftar's southern offensive was viewed with suspicion by Sarraj's Government of National Accord, which accuses him of wanting to install a military dictatorship in the North African country. Libya has been mired in chaos since the fall of dictator Moamer Kadhafi in a 2011 NATO-backed uprising, as the two rival administrations and numerous militias grapple for power.